The grain surface of most leather types is protected with a finish comprising a pigmented polyurethane, acrylic resin, or other polymer-based paint. Different types of leather have different finish thicknesses, often comprising different layers, depending on the desired aesthetics of the leather and the anticipated rigors of its intended use. 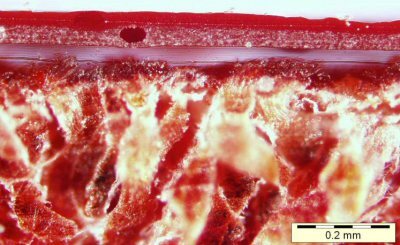 Using MICROSCOPY, the Leather Research Laboratory can accurately measure the finish thickness for you, for quality assurance and various other purposes.